Dostoevsky’s classic novel “Crime and Punishment” recently made its debut as a rock opera at the Moscow Musical Theatre with tecnical partner Polymedia integrating CAST BlackTrax real-time motion tracking system with a d3 media server. Together with innovative staging by renowned director Andrei Konchalovsky, they accomplished 6D video mapping on the show’s scenic elements. Polymedia chose a d3 4x4pro with Quad-DVI video format conversion cards to process the tracking data for the moving and rotating set pieces. Twelve simultaneous DVI 4K outputs from the single server enable eight projectors to map content to the scenic elements. 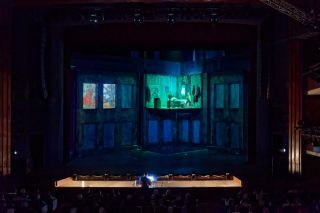 The set pieces, which change position and content 36 times during the performance, are based on sketches by Matthew Deely, a set designer who works with theatres worldwide. The d3 system cross-links the projectors adjusting the brightness and contrast balance of the content. Polymedia also used d3 Designer, the software-only version of the d3 production suite. “It had a very easy user interface and provided us with all the necessary tools to make a magnificent, high-tech show,” said Novikova. “For our earlier projects we used another brand of media server. But for ‘Crime and Punishment’ we needed a partner with a wide experience in shows, particularly shows featuring BlackTrax integration. “Thanks to the Polymedia engineers, ‘Crime and Punishment’ has gone down in history as one of the most technologically-advanced performances ever to be staged in Russia,” said Mikhail Shvydkoi, art director of the Moscow Musical Theatre.